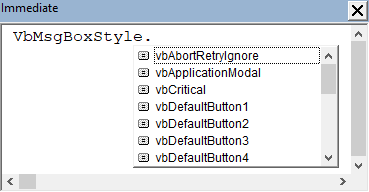 The VBA MsgBox() function allows a choice of an optional icon from a list of four. The icon is displayed to the left of the Prompt. Icons are optional. The MsgBox function can display a maximum of one icons from the list. The names of the constants are displayed in the VbMsgBoxStyle Quick Info list (figure 1). 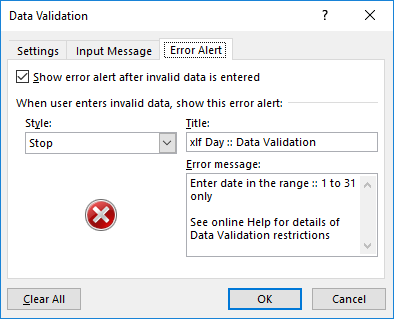 The Excel data validation tool allows the user to compose a custom message box from properties on the Data Validation > Error Alert tab (see figure 2). Three icons are available. The MsgBox vbQuestion icon has been dropped from the list. The message boxes from MsgBox() function, and the Data Validation Error Alert are compared in figure 3. "See online Help for Details of Data Validation restrictions"
Title = "xlf Day :: MsgBox"
Title = "xlf Day :: Data Validation"